Three Steps to an A on a Memorization-Based Exam | Go From Stress To Success! In college, most of the time, exams require more than memorizing. College is supposed to be the place where students move past just memorizing to applying, analyzing, and evaluating information – but not always. Some exams will still be focused on memorizing concepts, equations, definitions, terms, dates, and people. Some professors will want to know that you’ve memorized the basics, before they move forward into those higher-order methods of learning. That means you need to know how to study for an exam like this one. Here’s a three-step process to ace a memorization-based exam. The first task is to make sure that you have all the material organized and easily accessible. The second is to create study tools to help you memorize that information. The third is to use those study tools to put the information in your head and make sure you can call it back when you need it. Learn/Study: Interacting with the information you need to know. Check/Call Back: Showing that you know the information you studied. Study Tool: Something you create to help you study and call back the information. To study, you need study tools. To create study tools, you need an organized list of the material you’re going to be tested on. Your book and your notes are going to be your best sources for that material. Open a spreadsheet program. You can use Microsoft Excel, Google Sheets, and many other applications for this project. How much detail does your professor expect on an exam like this? Are they going to ask for dates, places, people? If so, make sure you note down each of those things in your List It All notes as well. Here’s an example of a List It All that a film student started on a film history class. After you’ve gone through the book and put all the terms into your List It All notes, sort the list alphabetically by the Topic column. Then go through your class notes and see if there’s any more information you need to add to “Other Notes,” or any terms that were mentioned in class that weren’t in the book. Add these to your List It All notes. Understand that the List It All step may take you anywhere from one to three days, depending on the length of your reading assignments and in-class notes. Notice that we have the same topic covered three different ways, so that you get used to answering questions about that topic in three different ways. Also note that just making the flash cards is a form of studying, because you’re interacting with the information. In the last step, you will make two more study tools, but the flash cards are always the key to this process – so make them first. However, no matter which way you use them, you will find that there are still some things you can’t really answer. For whatever reason, your brain didn’t absorb the information when you read the book, or created and used the flash cards. 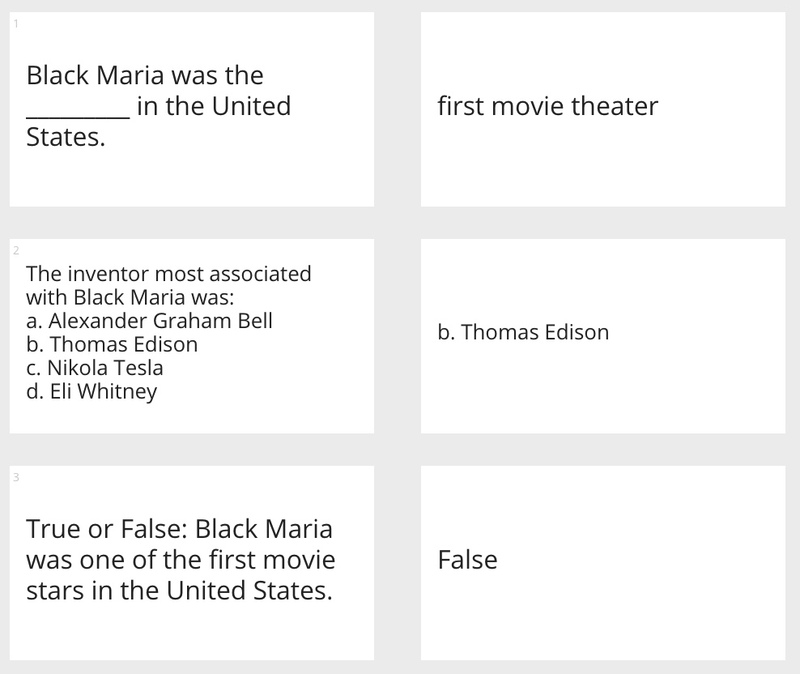 Set aside the cards you didn’t answer correctly, and move on to a different subject. The next day, start your study session for this subject by creating a different study tool, so that the information has a new pathway into your brain. One of the best secondary study tools is a T-chart. To make a T-chart, fold a piece of notebook paper in half long ways, to create two columns. Take the stack of cards you couldn’t answer, and copy their questions and answers onto the notebook paper, with the question in the left-hand column and the answer in the right-hand column. Make sure to number them, so that you can keep track of which questions go with which answers. Study these items for a while, and then put the T-chart away. Give yourself a day before your next self-quizzing session. When you get to your next study session for this subject, take out a new piece of notebook paper. Fold the T-chart so you can’t see the answer column. Then write down your answers on the new piece of paper. Finally, compare your answers to the answer column. How well did you do? Whatever questions you still aren’t getting, note them and set them aside for your next study session. In your next study session, get a new piece of paper and write down each question you still don’t have down with the answer written a few lines below it. Study this piece of paper for the rest of your study session, and then set it aside. Again, give yourself a day before your next self-quizzing session. To use this piece of paper, get out yet another new piece of notebook paper. Set the new blank piece on top of the original sheet. Slide it down until you can see the first question. Write down your answer on the blank sheet. Slide it down, and see if you got the right answer. Do this again for each question until you reach the end of the original sheet. By the time you’ve gone through these three steps, you should have a pretty solid grasp of what you need to know in order to pass the exam. Go through the flash cards the day before the exam, to review (and hold on to those flash cards, if your final exam is cumulative!). Then walk into that exam with confidence! Posted in Best Practices, Studying and tagged exam, exams, for students, quiz, study, test, tests.